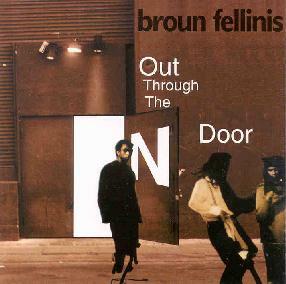 Broun Fellinis - "Out Through The N Door"
Broun Fellinis are a sax, bass, drums trio that play a difficult to describe blend of Coltrane and jamming jazz rhythms. The bass and drums often have that so-called New York downtown avant-jazz sound like the earliest Material albums had and the sax is compelling as is sails, wails, and flutters in accompaniment to the rhythm section's musical workout. The band consists of David Boyce (Black Edgar Khenyatta) on sax and vocals, Kirk Peterson (The Redeemer) on bass, and Kevin Carnes (Professor Boris Karnaz) on drums. The more I listen to the disc the more I realized how important Carnes and Peterson are to the Fellinis' sound. They and Boyce are like opposing forces come together to create something whole from their distinct worlds. On tracks like "Kemetik Science" and "859 Scott", Boyce's sax sermonizes as it blasts out Coltrane-like phrases that are both aggressive and serene. "859 Scott", in particular, is a great jamming sax showcase with Boyce wailing out expressive licks. Other highlights include "Levitate", on which the three musicians are so distinct from one another yet still tightly cooperative. Boyce cranks out beautiful sax lines, Peterson keeps the groove rolling along, and Carnes is a man possessed on the kit. "Honey For Oshun" is a rumbling jam on the rhythm side with cool soloing from the sax. This tune was way too short and I felt left hanging when I was expecting the buildup to erupt. "Rahel" is a sedate melodic tune with sax and bass playing off one another gorgeously, the sax being the most prominent in terms of volume but the bass being just as much a lead instrument. "Point Of View", "T.A.B.N.I.T.S. ", and "Sountrackers" are like jazz rap tunes with the first two featuring rather angry lyrics full of social commentary. In summary, the Broun Fellinis will appeal to jazz fans who like a bit of the eclectic and avant-garde but not at the expense of the melody and the groove. Take the metal out of Dr Nerve, add Coltrane on sax, throw in a dash of Material, and you get something that might be like the Broun Fellinis. Out Through The N Door is distributed by WEED Records. You can visit their web site.